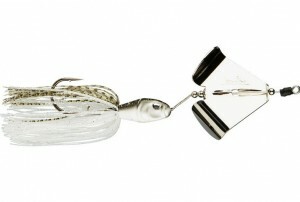 I know you hear all the time that lures are nothing more than tools. The thing is, though, it’s true. And nowhere was that more obvious than in our filming of the . It was early fall so the bass were in a transition mode. We launched our big BassCat with the Hobie kayak onboard. When we got to a backwater area we dropped the kayak into the water and went on back into a place that wasn’t accessible any other way. It was basically a perfect spot for what we wanted. There was a mixture of hydrilla and coontail that was still bright green. That mattered because most of the vegetation was starting to turn brown. The green growth — it was slightly submerged — was a magnet for small baitfish. And, in the fall when you find baitfish you find bass. We needed a bait that matched the hatch and that we could get down into the grass. But it also had to be a bait that wouldn’t foul on every cast. Our choice was obvious — a Molix Lover. 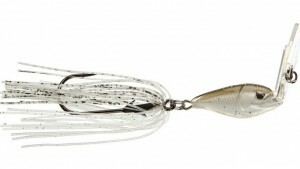 What made our choice so simple was that the Lover is just about the right size for fall baitfish and, at the same time, its design allows it to work through grass without fouling or hanging globs and strings of grass every time we brought it out of the grass. When that happens you’ve pretty much wasted a cast or, at the very least, not gotten what you should have out of it. The blade on a Molix Lover is fixed so it kind of works like a windshield wiper. It moves back and forth and as it does that it brushes most of the vegetation off to the side. That feature was critical because we wanted to cast our lure out, let it fall into the grass, pull it back out with an upward motion and then feather it back down into the grass. You can’t do that with most vibrating jigs. They’ll hang in the grass and once that happens they don’t vibrate properly. Our choice was a 3/8-ounce size in black and blue. We used a Berkley Havoc Rocket Craw as a trailer. I cut it down about an inch in length and removed the pincers. That gave me the size and action I needed. The experience doing this show was phenomenal. Being right down on the water with the fish was something I’ll always treasure. 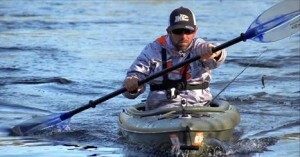 Watch the film a couple of times and you’ll see what I’m talking about and why I’m becoming addicted to kayak fishing. At the professional level nothing replaces a top-quality full-size bass boat like a BassCat. But for other situations nothing replaces the access to unfished waters and the outdoors experience a Hobie kayak gives you. Try it and you’ll know what I’m talking about.